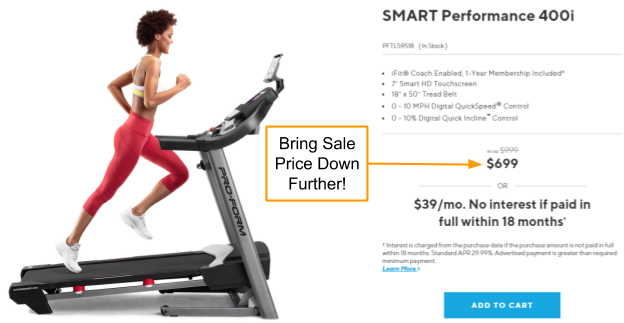 Add the ProForm SMART Performance 400i treadmill to your ProForm purchases while using ProForm Coupon’s promo coupon to save on your entire purchase. It is not difficult to employ the ProForm promo coupon on to your ProForm purchases. Just follow the directions below. 1. Click on ProForm promo coupon link. 2. Allow promo coupon to bring you to the ProForm site. 3. Choose all the ProForm merchandise you were intending to purchase. 4. Proceed to the virtual checkout area. 5. Examine the “Item Savings” section of your cart total. 6. Complete checking out and place your order. Outside of these directions, there is no further action required on your part. The ProForm SMART Performance 400i has a regular price of $999. However, it is often on sale for $699. While this is a good thing for those looking for a good deal, it does mean that the ProForm promo coupon will not activate. The promo coupon will activate only if your ProForm purchase total cost $899 or more. As you can see from the example image below, the ProForm promo code did not activate as the sale on the Performance 400i treadmill dropped it below the promo code activation price threshold. However, if you wanted to purchase another ProForm item, it would likely bring your total up. The discount will be applied to both machines. 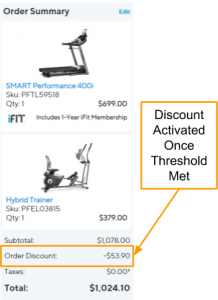 For example, if you were looking to not only pick up the Performance 400i but the Hybrid Trainer for some cross training, then your total costs would be high enough to activate the promo coupon. Once the items push the total costs over the promo code activation threshold, the promo code will take 5% off of all items in the cart so you can still save! This is not to say that sales will cancel out the promo coupon. As long as the sale price on ProForm does not drop the price below $899, the promo coupon will be able to save you money on your ProForm purchases. Just double-check before you go to buy your ProForm equipment. The ProForm SMART Performance 400i treadmill is the most affordable of all ProForm’s treadmills. It manages to balance high-quality with cost-effectiveness, providing a generous number of workout programs, speed, and entertainment features. With the improvements made to the Performance 400i with its addition to the new ProForm SMART series treadmills, this treadmill has much more to offer users. Most affordable treadmill – Out of all the treadmills offered by ProForm, the Performance 400i is the most affordable. This allows those with strict budget considerations to be able to afford a treadmill from a manufacturer who has a reputation for excellence. As ProForm stands by their equipment with excellent warranties and customer service, this makes the Performance 400i a better choice than other budget treadmills which may come with limited warranties and little recourse should the treadmill break down even in the warranty period. Mixes tech with an easy-to-use console – An easy-to-use console makes it easier to navigate the treadmill as you don’t have millions of barely labeled buttons to sort through. Instead, you can use the 7” touchscreen to navigate through the 50 onboard workout programs as well as access iFit Coach. 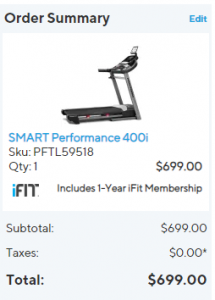 As you receive a free year membership with your purchase of the SMART Performance 400i, you can engage in greater exercise programs than has been previously available on budget treadmills. Also, you can place your tablet on the adjustable tablet holder, so you have easy access to your entertainment as you workout. Designed for limited space – Minimal space is taken up by the Performance 400i. While a treadmill will never be the smallest cardio equipment, the Performance 400 is a slim machine, measuring 32.75″ wide, 65.77″ long, and 56.42″ tall. This treadmill will fit well into most living situations and easily folds up so you can store it out of the way when you don’t need it. You need to take our ProForm promo coupon directly to ProForm, or it will not activate. It has to be used as instructed or you will miss out on saving money. So, review our instruction and go ahead and use the promo coupon below.